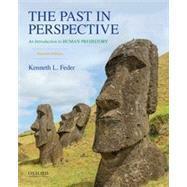 Ideal for introduction to archaeology and world prehistory courses, The Past in Perspective: An Introduction to Human Prehistory, Seventh Edition, is an engaging and up-to-date chronological overview of human prehistory. Kenneth L. Feder introduces students to "the big picture"--the grand sweep of human evolutionary history--presenting the human past within the context of fundamental themes of cultural evolution. Feder's unique, refreshing, and accessible narrative personalizes the past and makes it relevant to today's students. Using a consistent chapter format--"Prelude, Chronicle, Issues and Debates, Messages from the Past, and Case Study Close-up"--Feder helps students master both what we know and what is still debated about the complex story of the human past. Kenneth L. Feder is Professor of Anthropology at Central Connecticut State University. He is the author of several books, including Frauds, Myths, and Mysteries: Science and Pseudoscience in Archaeology, Eighth Edition (2013), and Linking to the Past: A Brief Introduction to Archaeology, Second Edition (OUP, 2007). What Happened to the Apes at the End of the Miocene? What Were the First Steps in Hominin Evolution? How do we Know the Hominins were Upright? Is There Other Evidence for Bipedality? Were the Early Hominins Hunters? Where Did the Idea for Stone Tools Come From? Why is the Fossil Record of Human Evolution so Complicated? Has Evolution Programmed us to be Killers? Did the Pleistocene Cause the Evolution of Homo erectus? What Enabled the Geographic Expansion of Homo erectus? Who Were the Hobbit Hominins? When did Homo erectus Become Extinct? Why are the Neandertals Extinct? Human Beings: An Evolutionary Success Story? What Does the Art of the Upper Paleolithic Mean? A Pacific Islander "Age of Exploration"
When did the first Migrants Arrive? When Was Beringia Exposed and Open for Travel? When Was Eastern Siberia First Inhabited? What Is the Age of the Earliest New World Sites? Why were the Pacific Islands Settled? Could Native Americans Really have come from Europe Instead of Asia? Who-or What-Killed the American and Australian Megafauna? Why does Complexity Develop in the First Place? Are Complexity and Inequality Inevitable? Why did State Societies Develop? Why were the Elites of State Societies so Conspicuous in their Consumption? Why did the Maya Collapse? What does "Collapse" Even Mean? Who were the Rulers of Copán? How Did the Inca Support Their Economic System? What Happened to the Ancestral Puebloans?